In this post, we will discuss how to work with Indexes in SQL and explain the concepts with an example in a simple way. I hope this is very useful for beginners and intermediates to help them understand the basic concept. We use indexes to increase the performance of the application and fetch the data very quickly from the table. Normally, after project deployment, we are facing some performance issues, usually in reporting if there are lakhs of records. We have to re-write the queries to increase the performance. The SQL server uses the index and views (selected and required columns) to find the data quickly. Indexes are applied to the column or view. 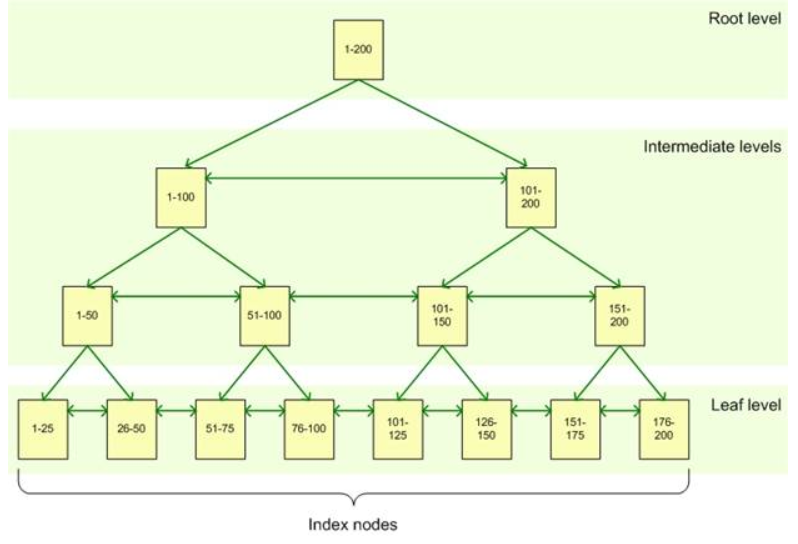 Whenever you create indexes in a table, internally, B-Tree is created like the below image. If we don't use an index, when we have a huge amount of data in order to search a record, each row will be scanned in the table and this affects the overall performance of the application. Hence, the use of an index is encouraged in such a scenario and by using indexes, we can save time and can improve the performance of database queries and applications. Index in SQL is a similar index that we find in the book. Indexes are created on table and views and indexes can help the query to find the data quickly. Table basically can contain four types of indexes. To improve the performance of the query. Non clustered index is stored separately from the table, so it requires additional disk space. The cluster index determines the physical order of the data in a table and stored or sequenced the data in ascending order by default. For this reason, a table can have only one clustered index per table. Whenever you are creating a table with primary key automatically, the clustered index is created. Hence, a clustered index should be applied to a column, having unique values. Also, much less modification is done on these values. Usually, it is applied to the primary key column of the table. A table can have only one clustered index, however, the index can contain multiple columns. The way telephone directory is organized is by the last name and the first name. Let’s take an example. We have a customer table without a primary key. Now, we are going to insert the record and after executing the below statements, we get the following output. We are checking if there are any indexes created or not with the below ‘sp_helpindex’ procedure. We are going to explicitly create a clustered index on customer table. After executing the query, you will get the result in ascending order and see the output below. Whenever we are creating a primary key, the clustered index is automatically created. Let’s take another example. We are creating a customer table with primary key. Please ensure that you drop the created customer table first. Then again, we are going to the insert the same record. We are trying to create one more cluster index on customer table but we cannot create more than one cluster index in a table. According to this error, we cannot create more than one clustered index in a table. In a similar way, we have created Employee and Department tables as output shown in the below screen. Field or a column on which index is created. 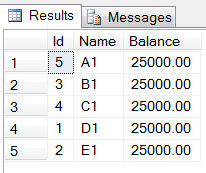 We can create a composite clustered index on Name and Balance Column. We have to delete the previously created index. And now we are again creating a composite primary key constraint. To find specific database in all indexes. Whenever we are dealing with large tables, Non-cCustered Indexes are very useful. Assume the above table has millions of records and you want to read the data; in that case the Non-Clustered Index will help in increasing the performance. The Non-Clustered index is stored separately from actual data, a table can have more than one non clustered index that can accept duplicate values in the column. The data is stored in one place and the index is stored in another place. The indexes have pointers to the storage location of data. A table can have multiple Non-Cluster indexes on it. We have deleted all the indexes from a table before creating non-clustered indexes output like below. We are going to create a non-clustered index on ‘Name’ column. We can create more than one non-clustered index on a table. We can store duplicate values as well in Non-Clustered index column. We can create a unique index using the below commands for uniqueness or records in the table. We create a Unique Index to provide Uniqueness of Index Column values. When a Primary Key or Unique Constraint is used on a table row, a Unique Index will get created automatically to avoid Duplicity. We can have only one cluster index per table but we can have more than one non clustered index on a table. As a clustered index refers back to the table, Cluster index is faster than a non-clustered index, non-clustered index is stored in another place. Non - clustered index is stored separately from the table, so it requires additional disk space and Cluster index doesn’t require additional disk space. It determines the storage order in the table.